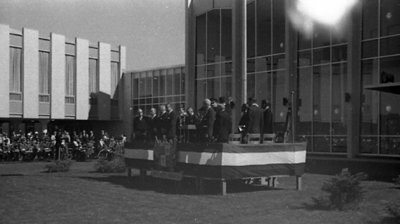 A black and white photograph of dignitaries on the podium at the opening ceremony for the new Ontario County Courthouse and Administrative Building. 605 Rossland Road East, September 30, 1964, Brian Winter. Whitby Archives A2013_004_111B.